More than a millennium ago, within the barren wastes of the cold Arctic North, lived a people of great courage and strength whose remarkable feats have been recorded in countless tomes of ancient Sagas. Prepare to meet the hardiest Northmen of the Medieval ages, the Vikings of Hálogaland. Centuries before Scandinavian historians began recording the lore of ages past, Norway was divided into countless chiefdoms, petty kingdoms, and other earldoms that were in practice all independent entities. Of all of those sovereign lands, the one farthest North, stretching all the way from 65 to 70 degrees latitude North, was Hálogaland, the abode of the Arctic Vikings. The origins of Hálogaland are all but lost in the mists of time, but the Xth century epic poem Háleygjatal, composed by the Norwegian skáld Eyvindr Finnsson skáldaspillir tells of the god Óðinn seducing the mighty giantess Skaði and thus creating the first generation of North-Norwegians (1). Other tales name the legendary hero Helgi as the founder of the dynasty that would then bear his name (Helgi’s Land → Hálogaland) (2). Vikings of the Norwegian Arctic had quite a distinctive lifestyle, rather unlike their southern cousins. While it is possible that they took part in raids against Britain and France, the old sagas don’t mention it. Instead, they tell of their intricate and complex relationship with other people of the Arctic, most often their Finno-Ugric neighbors. Most often though, it would appear that the relationship between Sámi and Norwegians was relatively peaceful. In the masterpiece Egils saga, written in the early XIIIth century, we hear of Þórólfr Kveldúlfsson, a follower of the king Harald Fair-hair who acted as his governor for the whole region of Hálogaland. In the saga, Þórólfr is said to have voyaged far and wide in Sámiland, collecting tribute and trading with the local population for goods such as fur and hides. Later in the saga, he joins the ranks of the legendary Finnish king Faravid of Kvenland (Bothnia) in a bloody battle against Karelian raiders. Despite his great qualities as a leader and trader, Þórólfr would later be betrayed and killed by the son of the same Harald Fair-hair that he fought for. His family would avenge his name tenfold by defeating and killing his betrayers before escaping to Iceland. Þórólfr’s nephew, Egill would later become an even fiercer opponent of the Norwegian kings (6). All those sagas discussed higher up may have been written several centuries after the events they purport to describe, but other, more contemporary sources support their stories nonetheless! Indeed, in 890, the Anglo-Saxon king Alfred welcomed a rather exotic guest, a man named Ohthere (Ottar) who lived, according to a contemporary account, in Halgoland (Hálogaland). On top of all of those fascinating tales of exploration and battles, the archaeological record, started a century and a half ago by some of Norway’s finest scholars, has revealed that Viking-Age Arctic Norway was indeed a land of plenty. Among other things, finds of Viking-Age hidden treasures have revealed numerous Finnic artifacts, some of which are on display in the Tromsø museum (8). Study of place-names and local history also shows that Norwegian and Sámi settlements, like those on Kvaløya, were often very close to each other and more connected than previously thought (9). All in all and unbeknownst to most, it seems that The Viking-Age Norwegian Arctic was teeming both with life and adventure. Norwegians, Sámis and Finns would trade, fight, and sometimes ally with each other while merchants and explorers would sail as far as the Kola Peninsula and Britain. Chieftains fought for their kings and for their kin as poets wrote songs about Gods, giants and their ancestors of old. Those songs and tales have survived to this day and are part of what makes North-Norway maybe the most fascinating expanse of the Arctic North. (1) Finnur Jónsson (Ed.). (1912 – 1915). Den Norsk-Islandske Skjaldedigtning (4 Vols). Strauss and Cramer. Leutershausen. Vol. A-I 64–68 . (2) Another theory for the name Hálogaland is that it means “High-Fire land” as Há = High and Lógi = Fire in Old Norse-Icelandic. (4) Ǫrvar was Odd’s nickname, it means “Arrow” in Old Norse-Icelandic. (7) Storli, Inger. (2004). Ohthere – Viking and World Traveller in Way North: Archeology in North Norway.42-50. (8) Sjövold, Thorleif. (1974). 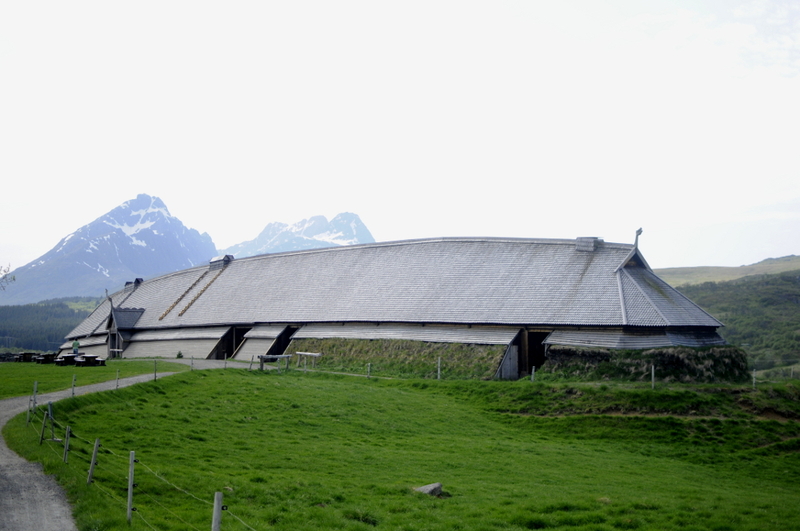 The Iron Age Settlement of Arctic Norway – Vol II. Universitetsforlaget. Oslo. (9) Bertlesen Reidar, Anne-Karine Sandmo and Ragnhild Högsæt. (Eds.). (1994). Tromsø Gjennom 10.000 År: Fra Boplass til By. Tromsø Kommune. (II) John Bauer: Odin in Rydberg, Viktor (1911). Die Göttersaga der Vätter. (III) A detail of Olaus Magnus’ Carta Maritima. (1538). Roma.